Ding, ding, ding… Ladies get your floral dresses and derby hats on because it’s time for a Tea Party Wedding Shower! It has come to that age where the majority of my friends are getting married and having babies. For most, reality hasn’t set in, but I’ve accepted the whole friends getting married era a while ago. I’ve been a bridesmaid five times already, so I’m used this this entire shabang. What I haven’t experienced yet was a tea party themed bridal shower. Adrianna and her soon to be hubby, Artur coordinated their shower, which was on April 3rd at Gala Banquets in Chicago, IL. From lavishing tea cup centerpieces to tasty treats to hilarious games, I must admit they definitely made it a memorable event. I had the pleasure of stealing a few minutes of Adrianna’s time to have her respond to some questions about her event. Hopefully these will help you or a friend out when planning your wedding shower in the future! You had such a beautiful theme! What was your official wedding shower theme name? Which colors were used? Thank you so much! I was going for an English afternoon tea party theme. For my outfit, I tried to channel my inner Kate Middleton through my use of a hair fastener. I also asked my bridesmaids to wear floppy hats to evoke the feeling of afternoon tea at the English countryside. I tried to use a variety of pastel and soft colors, such as blush pinks, ivory, pale green, pale yellow, etc. Anything with ‘shabby chic’ floral patterns was a must! How did you come up with the theme? I never had the opportunity to play ‘tea party’ as a little girl (only child problems! ), so I wanted to fulfill my childhood fantasy through this event. I attended a bridal shower several years ago which was also tea party themed, and I fell in love with the idea instantly! I also devoted many hours on Pinterest, searching for ideas and inspiration for invitations, décor, etc. Where did you find all of the décor? Any tips? My bridesmaids and I made the centerpieces and I purchased all of the mismatched tea pots at thrift stores. All were under $2 and such a steal! The tea cups that were used for décor were borrowed from my godmother, who recently had an “Alice in Wonderland” themed birthday party for her granddaughters. I also found my chalkboard signs and tissue poofs at the $1,$3, $5 dollar section at Target. How long did it take to plan this shower? Taking into account when we first started our registries to the day of the event, I would say about 3 months; yet the bulk of time was devoted about a month before. Can you list the steps you took to make it a success? We first began with our registries. Artur and I went to our selected stores and added what we called “bare bones” to the list (i.e. basic kitchen necessities). The lists are always editable online or in store, so we had the convenience of working on it at our own pace. We then ordered our invitations. Then I slowly started looking for tea pots, chalkboards, tissue poofs, etc. as décor pieces. Is there anything you would change during your wedding shower planning process? Anything you would change during the actual event? Nothing! Both of our families and my bridesmaids were extremely helpful throughout the process. The day exceeded my expectations. What were the games played? There were a total of 4 games played. The first was a “door-buster”, where a sticker of an owl was placed under a random plate at each table. Whoever had the owl, won a prize! The second game was “What is in your purse”. The third game was the “Shoe game”, where Artur and I had one of each other’s shoes and had to answer questions about our relationship (i.e. “Who spends the most money?” and each person would raise the shoe of the person whom it best describes). Lastly, we played Bingo to engage the guests during the gift-opening. What can you recommend for future brides who are planning their wedding shower? Begin planning early and enjoy the shower! It flies by very quickly! Can you give us a wedding day teaser? It will be a beautiful day filled with love and happiness… and a lot of white! J I can’t wait to marry by best friend in less than 3 weeks! With the lovely future bride, Adrianna Sulimowicz (middle). She looks so classy! The Knot wrote an article on how to play the shoe game along with questions to ask. Here’s the link! I personally like to spice things up by asking the questions: “Who said I love you first?”, “Who made the first move?”, “Who kissed who first?”, “Who spends more money on clothes?” < You might be surprised by that answer. I think to make things more personable and funny, the closest friends should compile a list of questions. Friend tend to know more than family. Obviously, let’s keep it PG13, unless it’s an adults only bridal shower. Here is Adrianna with her lovely bridesmaids. 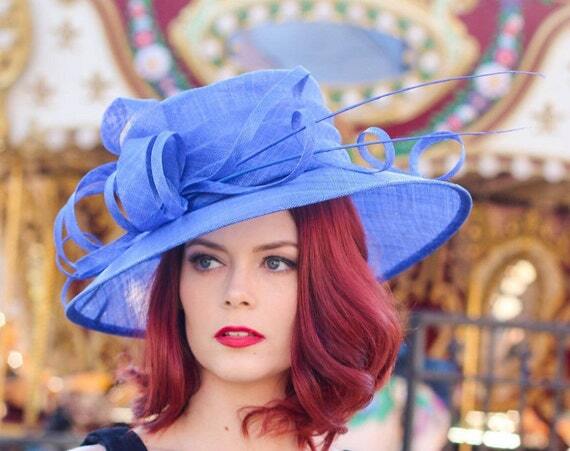 I personally LOVE this theme just because I would have an excuse to wear a derby hat on a day that’s not Derby Day. A couple of years ago I went to a wedding shower where the bride asked her bridesmaids to wear large hats just so her girls can be distinguished among the guests. It’s a fun touch! I found my hat at TJMaxx, but that’s hit or miss. If you have time to order online, I would recommend finding something unique on Etsy. If your cost sensitive, there is also the option of ordering your hat from ebay. I personally only had one bad experience with ebay, where I ordered a bathing suit and it never came in. The communication between the store owner in China was not the easiest & I never got my money back. Besides that, everything that came in was pretty decent quality. You get what you pay for, right? Besides that, I recommend seeking out local thrift stores and wedding shops. This was the entry table for the couple. Notice that hint of candlelit & a touch of the couple’s engagement session photos. Your bridal shower is a great place to re-purpose your engagement session photos. Yum! If you’re not sure what pastries to include into your Tea Bar, I recommend the basics: macaroons, fruit tarts, mini donuts, puff pastry, chocolate croissant (my favorite are at Starbucks), your favorite cake flavor, and some healthy options for those that don’t eat pastries – fruit is the best and the safest option. As for tea options, if your venue doesn’t provide them, my personal favorite brands are LLOYD & Teavana! If you live in a very populated Eastern European area, you might get lucky and find LLOYD in your local grocery stores or Deli’s. If not, they have numerous options on Amazon. I drink 4-5 cups of tea everyday, so I’m very particular about my tea brands. The marquee letters are still on trend & you can get them pretty much at any crafts store. Michael’s Arts & Crafts, Joann Fabric & Craft, and Hobby Lobby always have them on sale. Follow Adrianna on Instagram to be in the loop during her wedding journey.